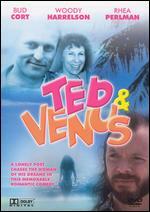 Episode #39: Ted & Venus (1991) | Why Does It Exist? I could’ve selected the scene of Martin Mull changing, but I think contextually you need to see what this film advertises as. Hubris shows a creepy, potentially threatening side in this film from triple-threat actor/writer/director Bud Cort. Whereas helmers of previous Why Does It Exist vanity projects like One Trick Pony and Falling From Grace were content in placing themselves in the mopiest situations, Cort goes a couple of steps further and casts himself as a mentally-ill stalker in what presents itself as no less than a light rom-com. He plays a gross, sub-Bukowski poet that falls madly in love with a beautiful woman and hounds her constantly under the watchful eye of his best friend, played by Jim Brolin in full beach-bum mode. Our guest Jenna Harkness and I discuss the myriad of problems of making a rom-com about sexual harassment, the questionable composition of fruit salad, eating babies in fiction and a very belated rehash of every conversation everyone had after the whole Tosh thing a while back. Music this week by Yardlets. The track Lot Lizard as well as their new album can be found here. They will be performing as part of Pop Montreal on September 20th at O Patro Vys.